Our primary objective as vice captains is to introduce freshers or anyone new to rowing to the sport and teach them how to row. Rowing is a great sport to take up at uni and is very popular. We aim to make sure we get the most out of those interested, ensure they give their best, and in turn, reap the rewards in winning plenty of races! But most importantly, we want those rowing to have fun, enjoy what rowing has to offer, not only the sport itself but the social aspects as well. we are all doing our part to maintain the club and its equiptment. time, we can only help with problems we know about. 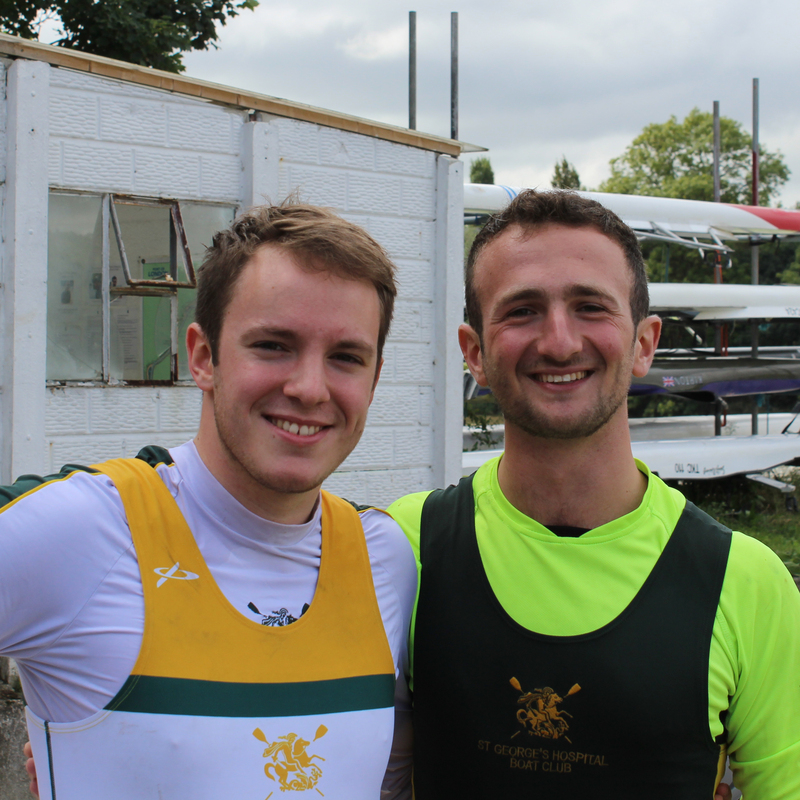 Hi, we’re Ollie and George, the SGHBC men’s captains. Our role is to co-ordinate the men’s squad for outings, land training, and races. We make sure that the squad is on target to meet our goals and individual athletes are developing. We are lucky to be working with Stu Pearce this year as the men’s head coach, who we will be working with to make sure this is a golden (and green) year for SGHBC men. Our primary objective as vice captains is to introduce freshers or anyone new to rowing to the sport and teach them how to row. Rowing is a great sport to take up at uni and is very popular. We aim to make sure we get the most out of those interested, ensure they give their best, and in turn, reap the rewards in winning plenty of races! But most importantly, we want those rowing to have fun, enjoy what rowing has to offer, not only the sport itself but the social aspects as well. Highlights of the year can include racing at BUCs regatta and UH bumps ! If you're hard working, committed, looking for a challenge in something new and up for lots of laughs, then contact Alex or Nadir and they'll be happy to help! This year will be my 5th year at St Georges and my 5th year in the boat club. I’ve spent half my time rowing and more recently have become one of the senior coxes in the club. I’ve previously been a social sec and vice-captain, so watch out for fines! I will be leading the coxing squad this year, organising outings alongside the captains and coaching the coxes so we’re all race-ready. The cox is a huge part of any boat (metaphorically) so I hope to help develop our already fab squad into safe, speedy and supportive team members. If you have any experience coxing or would like to give it a go then please don’t hesitate to contact me!